NEWTOWN -- A large color photograph of Olivia Rose Engel, 6, adorned an easel with a cluster of white roses arranged on the floor. Dressed in white, Olivia smiled playfully, bent slightly at the waist as if inviting those gathered to join in her fun. 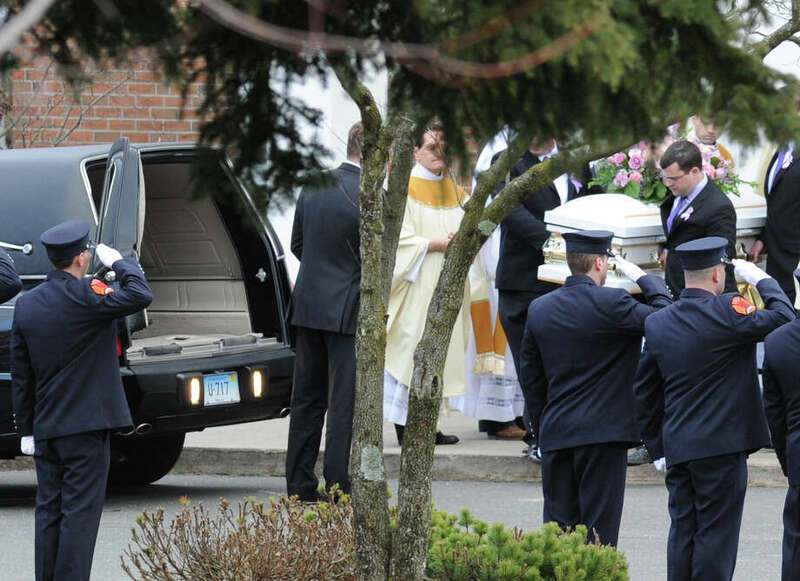 Yet the mood was solemn at St. Rose of Lima Roman Catholic Church Friday as hundreds gathered to say goodbye to the little girl, one of the students who died in the Sandy Hook Elementary School shooting a week earlier. Gov. Dannel P. Malloy, First Selectman Pat Llodra and Superintendent of Schools Janet Robinson were among those attending. A lone state trooper stood at attention beside the closed, white coffin in the sanctuary as Monsignor Robert Weiss returned to Olivia's last moments. He recalled that a Newtown police officer bent down to the dying girl, held her in his arms and said "I love you." Olivia's godparents, Dan Merton and Julie Pokrinchak, remembered the girl who loved purple and brought so much joy to the world. They spoke of her "infectious giggle," of how she laughed the loudest at her own jokes and how she loved to sail over the waves in a boat with her father, Brian, and grandfather, Richard Engel. Olivia was to be an angel in St. Rose of Lima's Christmas Eve pageant this year. As her mourners exited the chapel Friday, they learned that the pageant, to be held at Newtown High School, will be dedicated to her.